Elizabeth Wyman | The Journal Gazette John Konchar drives on Akron's Jimond Ivey during Wednesday night's game at Memorial Coliseum. Elizabeth Wyman | The Journal Gazette Matt Holba completes the no-look pass in a game against Akron on Wednesday at Memorial Coliseum. 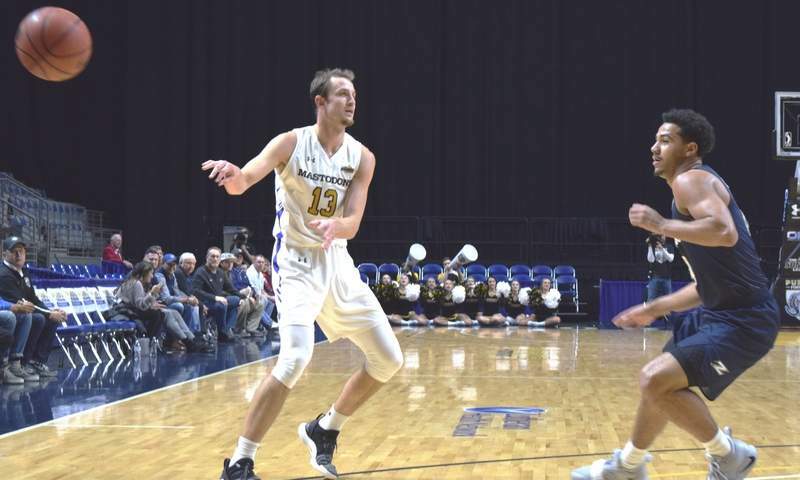 Purdue Fort Wayne senior John Konchar's heroic final seconds saved the day – and the game – for the Mastodons as they held off a furious rally by Akron for a 68-65 win Wednesday at Memorial Coliseum. With 34 seconds left and holding on to a one-point lead, Konchar grabbed his 11th rebound of the game and 967th of his career, making him the Mastodons' all-time rebounding leader. Later, Konchar added a steal and two clutch free throws to seal the nonconference victory. But even Superman himself couldn't seem to stop the improbable 16-0 run Akron (6-3) used to erase a 19-point deficit with 12:44 left in the game to eventually take the lead with two minutes left to play. Harrell scored 24 points to lead the Mastodons. Konchar had a double-double of 13 points and 11 rebounds. PFW (6-5) did stay calm – despite a scoring drought of more than five minutes – and the play of its two seniors carried it to the win in what would have been an embarrassing loss. The Mastodons had arguably their best first half all season, jumping ahead 17-5 with 11:59 left in the first half. The visibly frustrated Zips shot 2 of 13 to start the game and just 30 percent in the first 20 minutes. 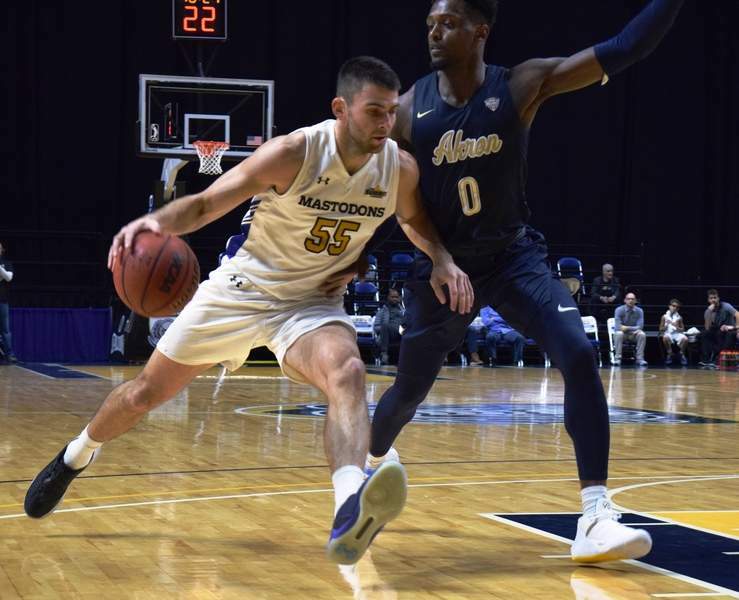 “Everybody would love to take the first half, bottle that up and duplicate it in the second half and you run away with an extended win, but that's probably not going to happen when you a play a team with the caliber of Akron,” Coffman said. PFW freshman Jarred Godfrey got the start over redshirt junior Marcus DeBerry and the 6-5 guard made a nifty up-and-under move to make it 24-13 with just under eight minutes to play in the half. He finished with seven points. PFW led 40-25 at halftime, but then Akron went to a 1-3-1 defense that threw the Mastodons for a loop. The 'Dons had 13 of their 20 total turnovers in the second half. Daniel Utomi scored 13 of his 23 points in the second half to lead the charge for the Zips. Even with its halftime improvements, Akron still shot only 35 percent in the second half and Coffman credits his defense for that and saving the game.